We went to the zoo to see the mammals. 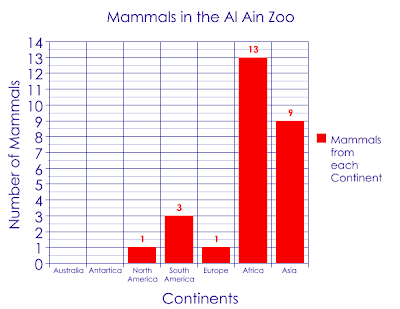 Africa had the most mammals. Africa had 13 mammals. Australia and Antarctica had no mammals. The wolf lives in four continents. The wolf lives in North America, South America, Europe, and Asia. Thanks for letting me know what continent has the most mammals. I will tell my students. Did you do the graph? Yes I did. I did it on the Internet.